Tis the season to brine olives! Or salt them, if you prefer. Whether you’ve grown them yourself or foraged them from bird-sown trees, it’s late Autumn that you want to pick and cure them. 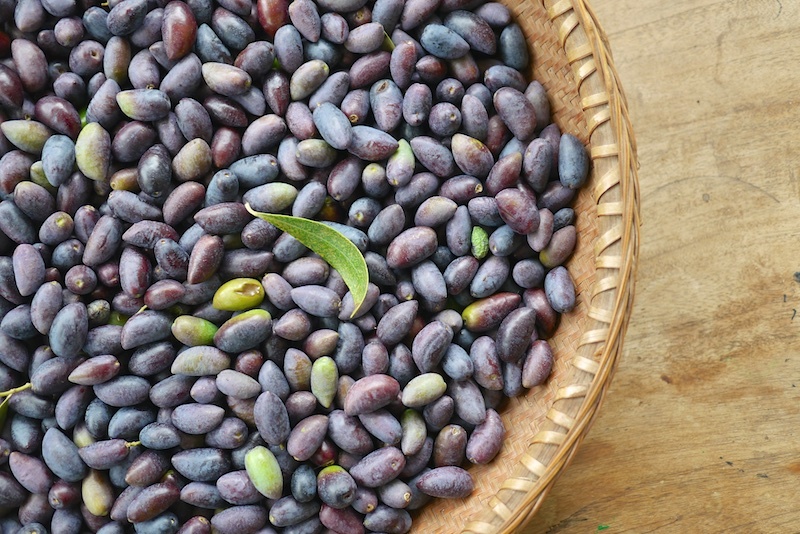 There are many ways to cure olives, but the essential thing is that you extract the glucosides from them – the chemicals that make the olives very bitter when just picked. You can do this by curing them in water and changing it daily, or dry salt them, or salt then smoke them, or you can do it with a rather complex combination of water + brine sequences. Or, if you’re slightly time poor amongst your enthusiasm (like us), then straight-up brining is a good idea. First, procure your olives. Then wash them well. Following a good wash, slit each olive (you can also just squish them each a bit) to break the skin, to ensure the brine can penetrate to extract the bitterness. If you do not slit your olives, they will still brine, but it may take, literally, years. We learned that the hard way a fair while back. Never again – slits R us. Once your olives are slitted and ready, it’s time to make up the brine. Use a good, non-iodised rock or sea salt. We used Himalayan rock salt because we have a great drum of it in our pantry, but use whatever you can get that’s straight-up salt. Warm some water (more than you think you’ll need) slightly in a pan and add a handful of salt, stirring to dissolve. Then, add the raw egg (**still in it’s shell). The egg is your brine barometer – if it floats, your water is sufficiently salty. If it sinks, add more salt. Alternatively, you can use the basic ratio of 1:10 to make a 10% brine, which is what the floating egg (should) give you. If unsure, use the ratio instead of the egg. Pack your olives into a clean jar (squish them down a bit, the tighter the better) and pour the cooled brine over the lot, until the olives are submerged. 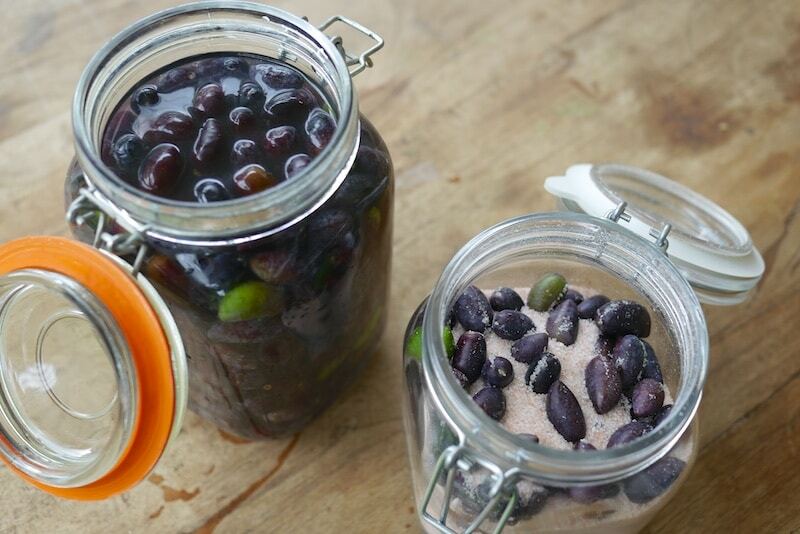 Like any brine ferment, your olives need to be submerged in the brine to do their brine-y thing. To help them submerge, you can add a piece of ice cream container plastic cut to size, or a ziplock bag of water if you wish, or fermenting weights if you have them. Personally, we just pack the olives in tightly so their ability to float is minimised, fill the brine to the very top of the jar, and seal. It works for us. 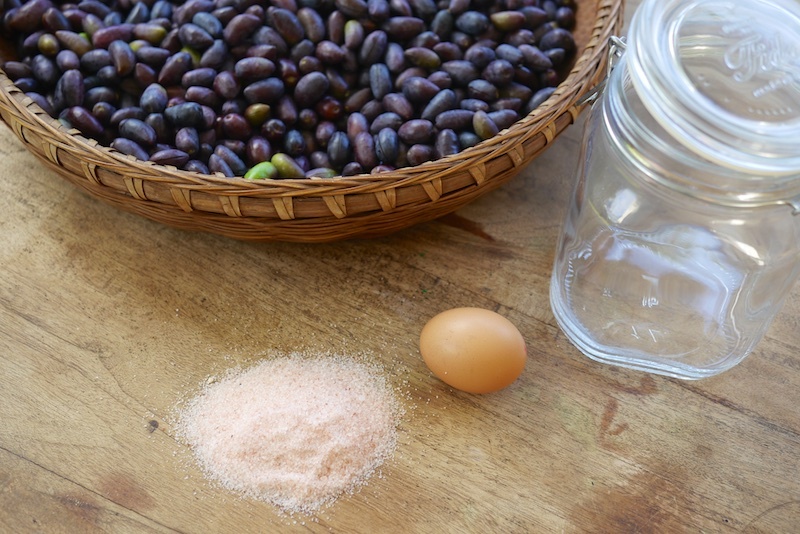 Keep your olives somewhere dark, but not so remote that you don’t remember to agitate them every few days to a week. The cupboard is fine. Like the proverbial piece of string, it depends – on the size of your olives, their ripeness, and your desired saltiness. Taste them every a few weeks, and get to know the taste of brining olives – you’ll soon get a feel for when they’re as you like them. 6 months to a year is the spectrum. Once your olives are ready and you’ve drained the brine off them (which will now be very bitter) – it’s time to decide how you want your brined olives to roll. At this point you can store your olives in olive oil, in vinegar, or in newly-made brine in the cupboard for up to 6 months. Adding herbs or spices at this point is good. You can also smoke them. Or just eat them. Brined olives on the left, salt cured olives on the right, much needed washing day in the background. 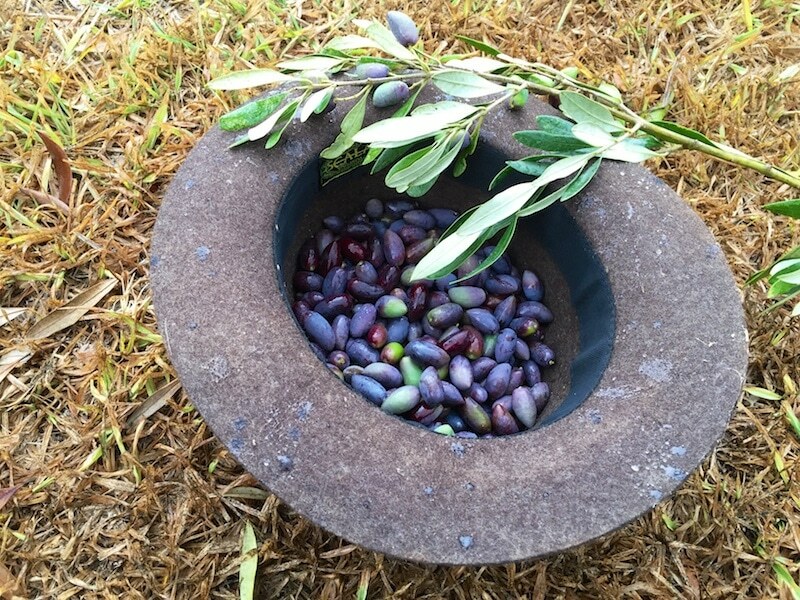 This method is great for smaller olives (like these kalamatas we scored from a tree on our last road trip). First up, prepare the olives as above for brining – wash them and slit them. Then, take your clean jar and add a layer of good quality, non-iodised salt, then a layer of olives, and so on until the jar is full. The salt will trickle down between the olives, but as long as it’s all packed in there, that’s ok. Your salted olives will need a shake and a turn ever other day – the olives will soon exude liquid and the whole jar will become rather slushy. That’s good. Keep going. Start tasting your salted olives at around the 3 week mark, and when they taste right to you (saltier, and a bit shrunken, and slightly sweeter than brined olives), remove the olives from the salt. Once your olives are duly salted, you can eat them straight up, or store them in oil with herbs. They’re pretty darn yummy. More posts about how to store the season with preserves + ferments here. Learning how to make a great seed raising mix means you are givin . . Thanks for your generous technologies enjoyed from time to time. I’d be a bit cautious about the egg-float guide. Quite possible for an older egg to float in a too-weak brine. As for keeping them submerged, I used a technique from the Abruzzo last year for the first time with olives. Use short sections of fennel stalks (flower end), roughly ‘woven’ together in a mat. Push that down on top of the olives and they stay submerged nicely. 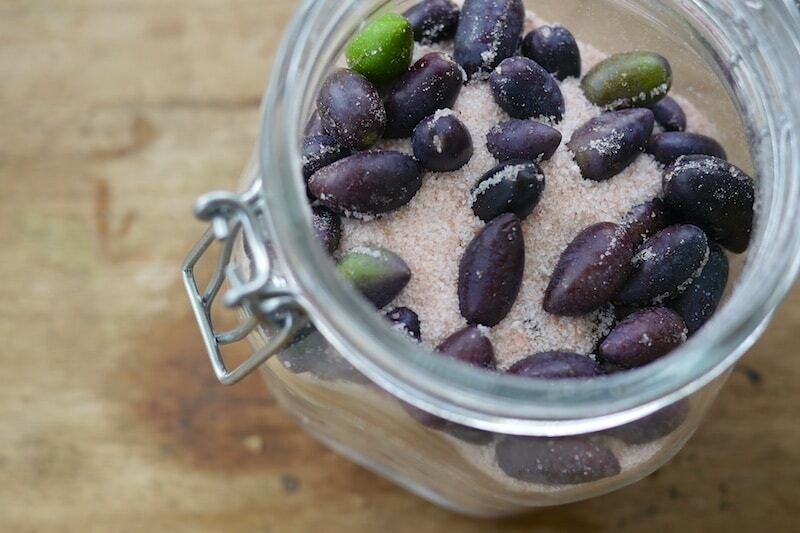 ROCK SALT CURED OLIVES – Marina Bistrin’s method. I cure my neighbour’s small to medium sized olives in coarse rock salt. They are the oval type – not the pointy Kalamata ones pictured in the article i have just read. 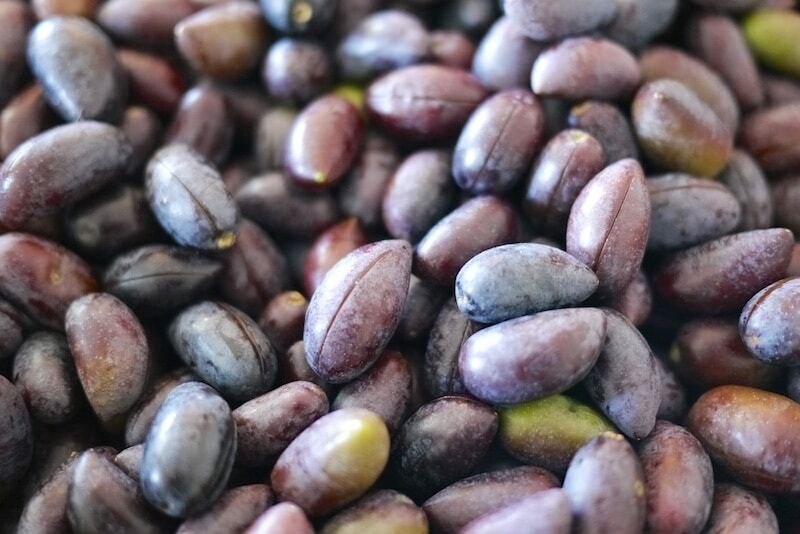 (For some reason the kalamatas we buy are always slit whereas the oval olives are usually cured without any slit maybe Kalamatas are more bitter). With my method, i put the olives into pillow slips – say 1 or 2 kg in each bag and pour on course Rock Salt – the largest of the pieces is about half a cm. 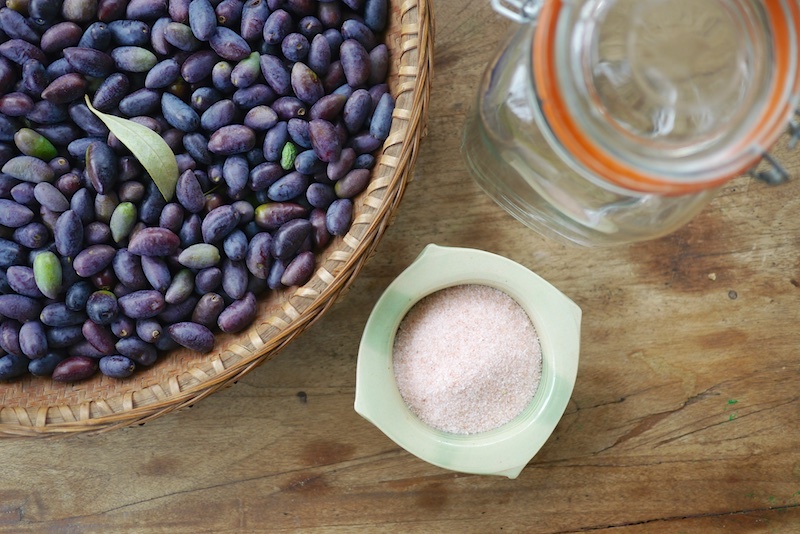 Don’t use fine salt as that tends to infiltrate the olives more and make them too salty. The cheapest rock salt i found that is easy to get is from Asian groceries. In Melbourne. The salt absorbs the moisture and they sometimes drip – i mix the bag up once or twice a day with the salt to evenly distribute it and put them on a performated base in an airy place to dry out – you may need to take out the salt, dry it in the oven and repeat. As it is cold when we harvest down here, i put it on top of my indoor heating system till dry enough. Store in the salt as i have had mould grow when i have taken my own out of salt as well as with commercially bought ones. 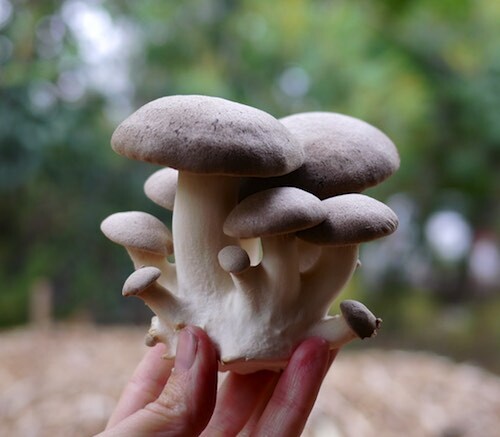 If you are sure they are dry, you can take them out of the same and douse them in a little balsamic vinegar , say tsp / jar, (for insurance to deter mould and it has a nice flavour). If unsure, store in salt till you need to eat them. My old standby is the score-soak-pickle method, very similar to yours, Kirsten. After scoring the olives are submerged in fresh water which is changed daily. After 4 days (black olives) or 6 days (green olives) they go into brine. I top up the jars with olive oil. 2 months later they’re ready. Can either be drained and eaten as is or marinated and then refrigerated. Thanks Milkwood for your ongoing inspiration. At times you are truly a light in the dark of night. 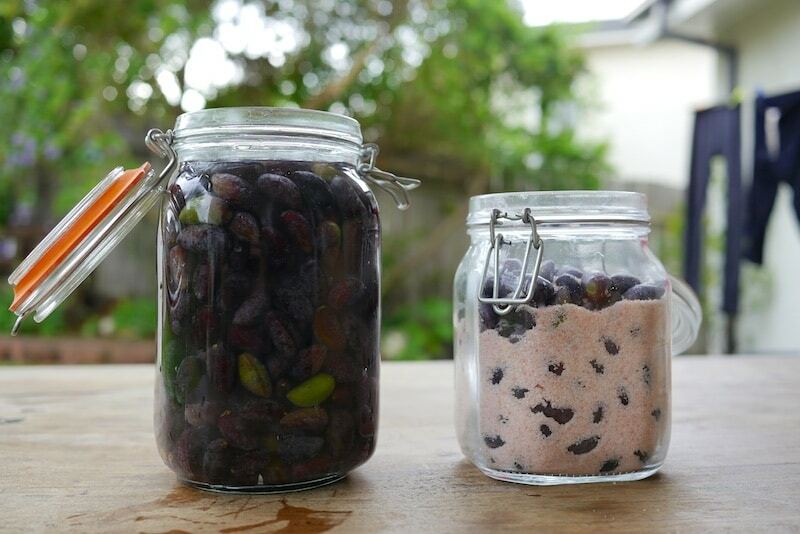 Has anyone heard of using sea water to brine olives? I live close to the beach and I have wondered if I could avoid the whole dehydration process to get sea salt and just go straight to the source? I’ve also wondered about dangling the olives in a net from a float and an anchor of some sort, in the ocean itself. 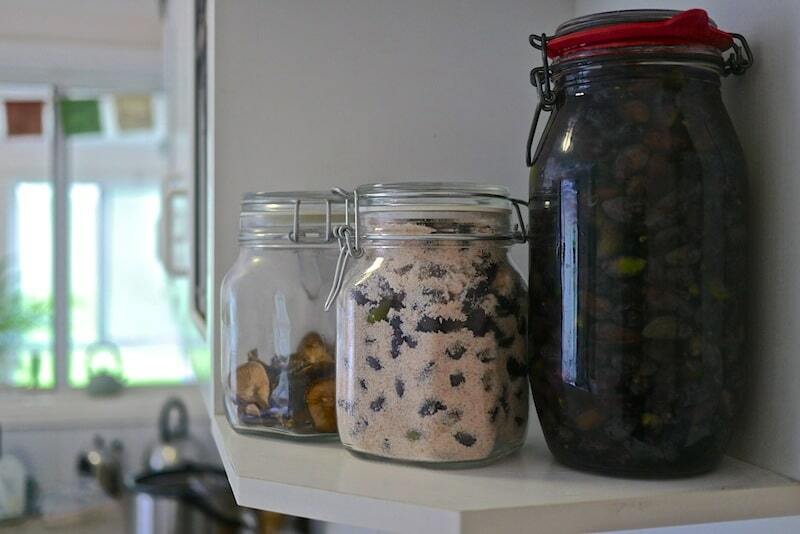 This would avoiding the need to change the brine each day – just go for a swim a week later and collect your olives. Tristan, I’ve seen references to curing olives in the ocean, on a few websites. It looks like it could have been an older tradition in Greece maybe. If you do a search on the internet ‘Curing olives in the ocean’, you will find some info. The tricky thing is not loosing the olives to the ocean. I have read that sea water is fine for brining olives, though I haven’t tried it myself. If I lived closer to the ocean I’d certainly use it. Tristan- I have been told that using sea water is a traditional Greek method. Apparently they just used to hang the olives in a cane basket over the side of a boat and they rinsed and brined nicely. Worth a try I think. I am curing olives for the first time and need as much guidance as possible. One concern I have is the discoloured squishy bits on some of the green olives I am curing, see pic. Would you know if this is a disease or if it’s a normal part of the process? I’ve got the exact same prob with my kalamata. Brown squishy patches form, discoloured blotches or the slit turns brown. I really would like a reply to this as I’ve been on 2 other blogs & others posted this same issue with no replies. All my olives were clean & unmarked before the problems started. A little bit of discolouration is pretty common. As long as your salt concentration is high enough it should be fine. sorry Jennifer… can’t see a pic, can you try including it again. I’ve had my olives in brine for 5 months. I Just checked them today, and there’s a 1mm thick jelly like film across the top. Is this normal? Are the olives underneath okay to eat? Can anyone help me on this. Thanks! This is common enough. If they are rinsed more often prior to brining this is reduced. It seems to be a mould growing on the sugars leached from the olives. Mine can get up to 1cm thick late in the season. Olives that are a little deeper have usually been unaffected by the flavour. Over time the olives are more likely to go mushy. I have found that after I am satisfied with the curing, rinsing well, adding fresh brine and some acid ( vinegar or citric acid) lessens both the mould and the deterioration. I was wondering if you possibly could answer some of my questions about brining. I did everything in your recipe but it seems after few days our olives are fermenting. Whole bunch of brine came through the top of the closed jar. And when I opened it there where lots of gas bubbles. Is that normal? Or are we doing something wrong? Thank you in advance for your help! Hi there. Thanks for your advice here. I put my olives in water and changed each day then moved them to just salt for another week. I felt they weren’t bitter anymore so put in olive oil with lemons. Now after a day they taste a bit bitter again. I fear I did the move too soon. Can I move them back to salt? Thanks a bunch. yeah I’d wash them and put them back in salt for a bit. Takes a while! Thanks very much for putting together such a helpful post. I had a lot of olives and I’ve tried both methods described here. My salted olives are just coming up to 3 weeks and are close to being ready. However, they are very salty and I’d like to tone them down a bit. Do you have any recommendations for doing this? Should i soak them in water before storing them in oil/brine etc? BTW, a friend of mine is on a farm and it is important for him to conserve drinking water. This is one of the only recipes I found that didn’t involve soaking the olives and changing the water regularly – so that’s fantastic. Thanks! We’ve been curing olives for the first time using both the brine (without changing brine) and dry salt methods. They’ve been curing for around 4 weeks now. The salted ones no longer taste bitter and we think they’re ready. They are however very wrinkly – is this normal? The brined ones are worrying us a little. They are still a little bitter and maybe need more time, but the concerning thing is that they are quite bruised discoloured in places (picture attached). They were ripe to begin with but not overly so. We’ve read about botulism being a possibility for home cured olives so we’re being cautious. Any thoughts on whether these look okay? yes wrinkles are common for salt cured olives! Regarding your brined ones, we’ve often had them go like that with slight bruising – it means they were bruised during the picking process (the bruises become more apparent with time. Regarding botulism, I’ve only read of that ever being associated with things being preserved in oil, brining in liquid with vastly insufficient salt, or in improper canning processes. 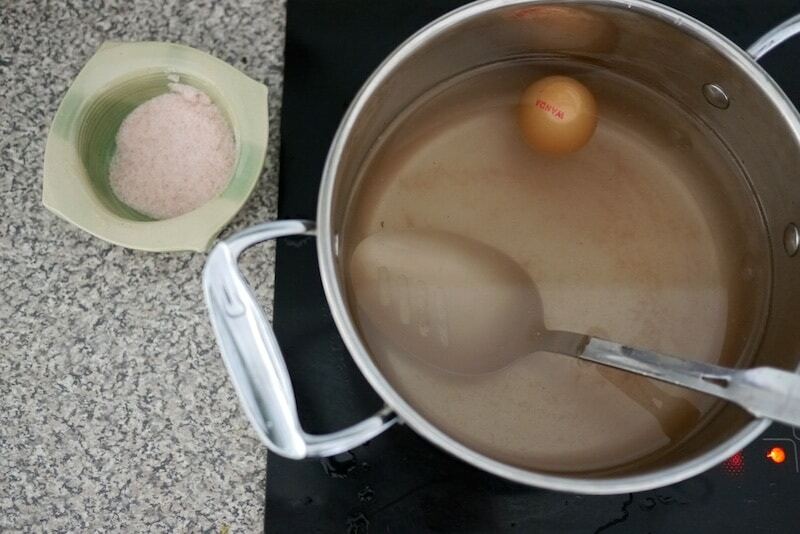 If you made a 10% brine, the literature says that is completely fine (an egg should float at a minimum of 10% brine). At the end of the day, though, it’s up to you. if you feel it doesnt look, taste or smell right, chuck it. We’re pretty sure that our brine was salty enough so I guess it’s just bruising. Given they were still a bit bitter we decided to take the brined olives out of their brine and try salting them for a while. The salted ones seemed ready to go so we’ve got them marinating in oil and herbs for a bit before eating. I just put them (all sizes, no slits-waste of time) in water salted to the max (when some remains on the bottom-very important). I make sure they are all submerged. After a couple of months they are ready to eat. I put them in plain water to remove some of the salt. I still have a couple of gallons on my counter in salt brine. And they still have some “taste” left unlike canned Calif olives which have all the character erased.